A nice little find trying to get somewhere else. No actual history on this mine; just the general history for all the sandstone mines in the area which I find interesting. The layers of Haslingden Flags outcropping on the valley tops and sides were in great demand to pave the streets of Victorian towns and cities. In many places the flags outcrop on the moor top and moor edge close to surface, and large open excavations are obvious. Where the best layers of flag (often named ‘lonkey’) are deeper below surface or lower down the valley side then tunnels are driven and large scale ‘pillar and stall’ mining was carried out. Attempting to move thick overburden without mining would have been expensive and time consuming as modern earth moving machinery did not come into use until the early 1900s. 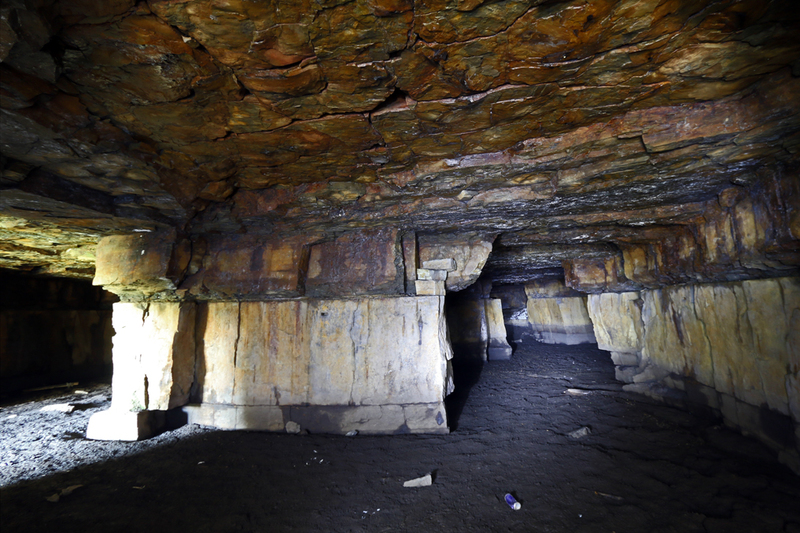 What remains in the hillsides are tunnel entrances to a grid –pattern complex of vast chambers separated by pillars of rock at frequent intervals to support the roof. 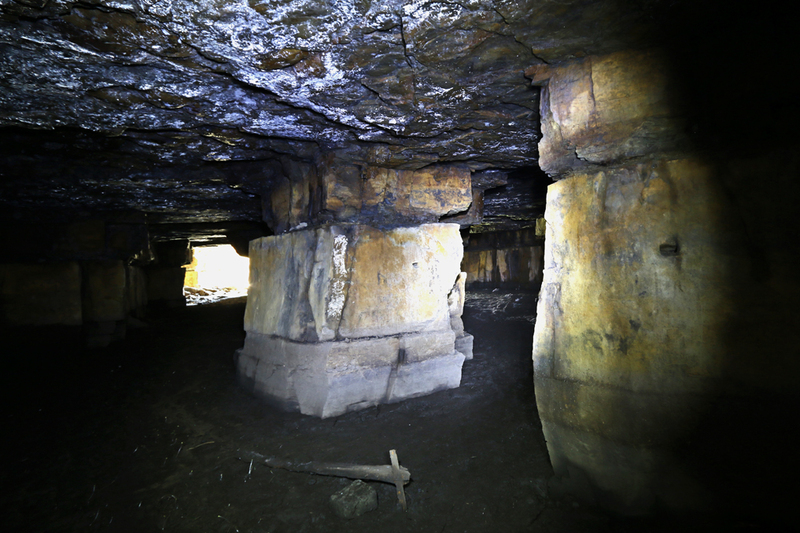 To create the chambers, the rock getters would pick out a weaker layer above the best stone. 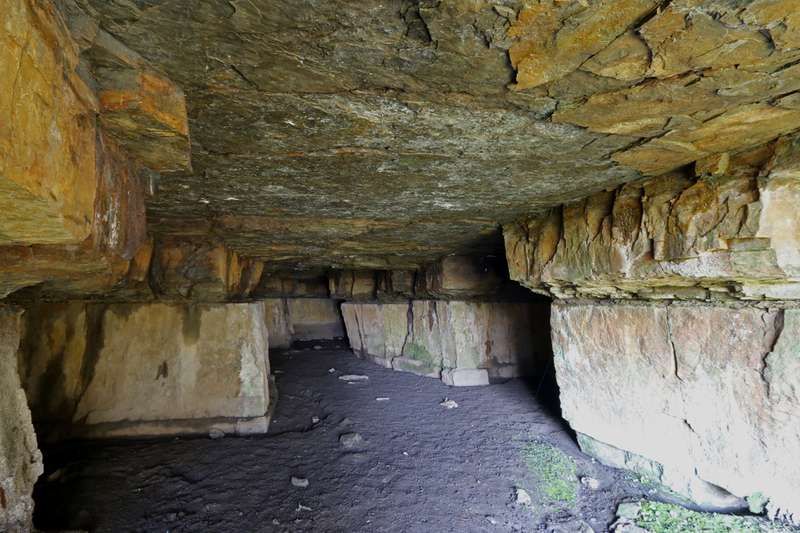 Often working on their sides with only shoulder height to move in, they would excavate a narrow ledge to create a working space, then work downwards on the strong rock with wedges and crowbars. Both the Lower and Upper Haslingden Flags were mined and distribution is widespread. 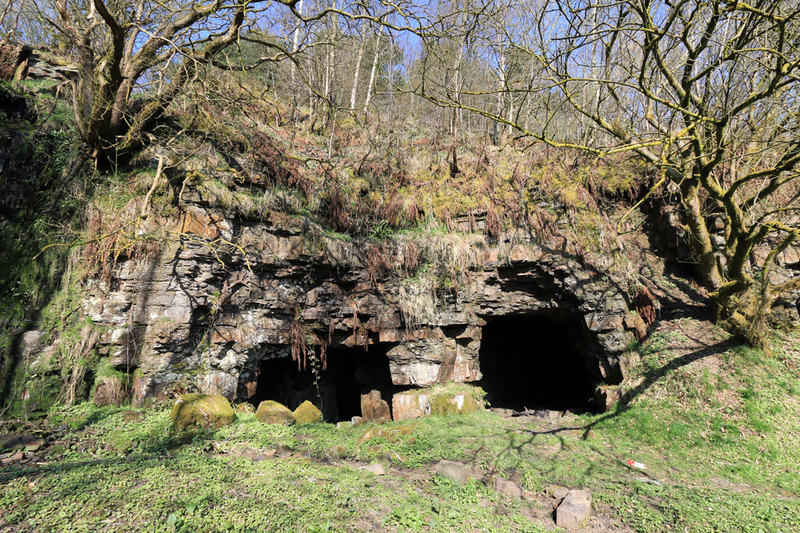 Our earliest records of stone mines are from the 1820s at Tong End Pasture, Whitworth; but they probably reached their peak from the 1870s onwards. Many of the larger mines closed before the First World War, although other proprietors continued until the 1930s. 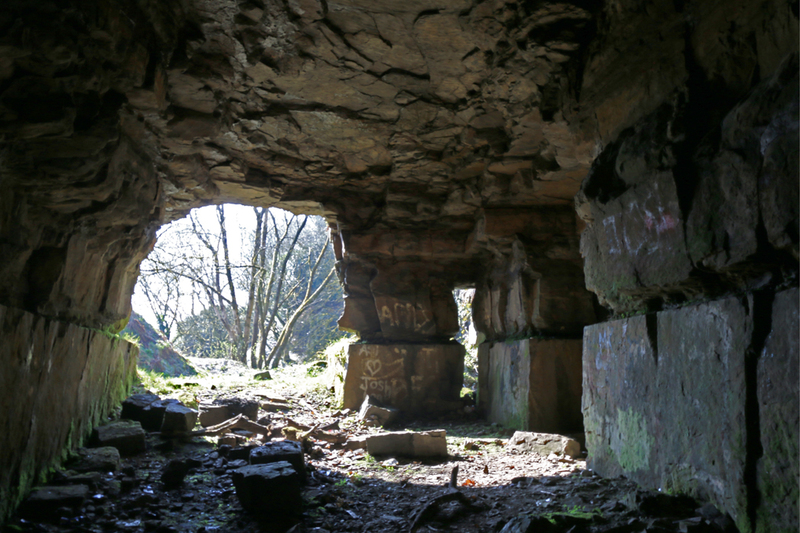 This wasn’t where I intended being today, I never even knew about this small sandstone mine. Having arrived at my 6 figured grid reference I soon realised it possibly wasn’t correct; area was not too fat out after all I was still in England and the County was even wright. I set off strolling up cobbled ginnels over the steep hillsides and wooded valleys looking for a suitable hole. This place even though it wasn’t quite where it was meant to be fitted the description and even looked like the couple of photos I have seen of the place. A classic example of Pillar and Stall Technique, plus you quickly became aware that this section was usually flooded up to 1 meter deep, was grateful of the dry couple of weeks. Things were looking good, the odd timer roof truss and still wasn’t sinking into the dark thick mud on the floor. Given the size of the place I should have been down, I was struggling to find too much in here. I just thought I’d missed a passage at some point. It was still a good looking place and just presumed I had popped in the wrong entrance as there are a few of them where I was meant to be in. I headed out to search for one of the other entrances only to find there weren’t any more and I probably wasn’t where I thought I was! 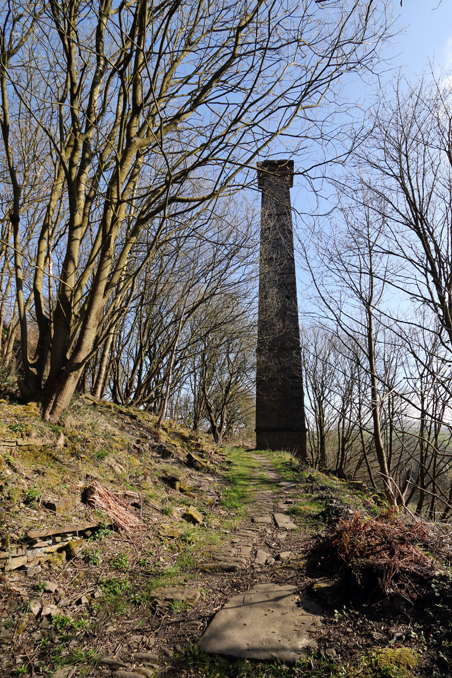 There was a nice derelict chimney not that far away and a good looking mill in the valley below. One for another day as it was the mine I was after. I set off on my search of where I should have been, only took another hour. I initially wondered if I’d put a report up on this mine, then whether just to include in in the mine I finally did as a footnote. However there is a name for it and even though no actual history it made a nice stroll in somewhere which probably isn’t done too often due to the water levels. 1st stroll of the day done, and an enjoyable one too. Love the colours of the mine, looks like a good explore, good report. Really nice report that. Was an interesting read and you captured it really well. Hi Lone Ranger just out of interest where were you heading for originally? 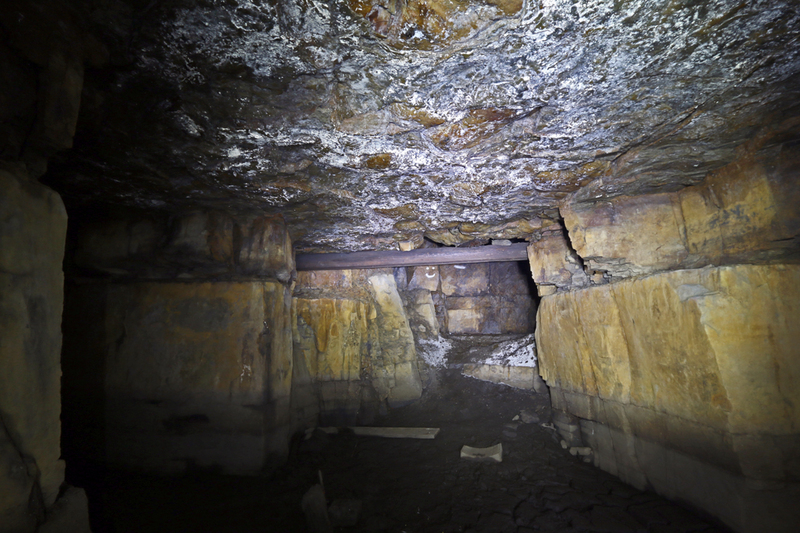 Me and a few friends were exploring a mine not far from this one with several entrances along it. I've added the location of it to the locations map.